When I began my career as a forensic artist, the only tools I had was a #2 pencil, a sheet of cheap bond paper and a strong will to succeed. Back then, I knew nothing about cognitive interviewing, facial identification catalogs, victimology or the value of networking. I was a ‘street cop’ who viewed my skills as simply another tool to help capture more crooks. Over the next four decades, I developed a much broader perspective. I became open to new tools and technology. Regardless the method used, I found that a facial composite was a helpful tool that brought value to many criminal investigations. Sadly, I’m not sure that many law enforcement professionals share my viewpoint. Over the last couple of years, I’ve noticed a downturn in the use of facial composites that I can only attribute to the following. Walk down the street and you’ll find cameras mounted everywhere, inside and out. They seem to be everywhere. In my experience, they provide little in their ability to ID the suspect’s face. But, a facial composite paired with a photo depicting a clothing style and posture, may help lead to an identification. Like CCTV cameras, they seem to be everywhere. While the photo may be of higher quality, sometimes the person on the other side of the lens doesn’t do a good job capturing the individual’s face. Positive ID evidence, such as fingerprints, DNA, tool marks, etc. have proven to be accurate identification tools. But, unless you have the suspect’s name, it’s hard to make the connection and locate matching evidence. Obtaining their name, especially through the release of a facial composite, is always good practice. Wrongful convictions based upon faulty eyewitness testimony is never good. Better training can help foster an atmosphere that increases eyewitness accuracy through better retrieval methods. Law enforcement is experiencing a high-turnover rate. Experienced investigators are reaching their retirement ceiling. Some investigators fail to brief incoming personnel about resources available to them. This includes forensic artists. I think it’s time to re-visit the value of using facial composites during criminal investigations. It starts with educating detectives on how a well-constructed facial composite can actually compliment other pieces of evidence. Those employed with a law enforcement or other government-tasked investigative agencies and those entering the forensic field are the perfect evangelists. Part of this paradigm shift would include rebranding the position of forensic artist to forensic facial imaging technician. This will help increase the ranks of those qualified to create facial composites and other related facial examination tasks, even if they lack artistic skills. I became a forensic artist to help capture more crooks. Limited artistic skills shouldn’t be a barrier to those who aspire to do the same. If you’re interested, I’ll teach you. 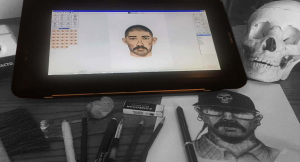 All you have to do is sign up for our SketchCop® Academy courses and let the learning begin!